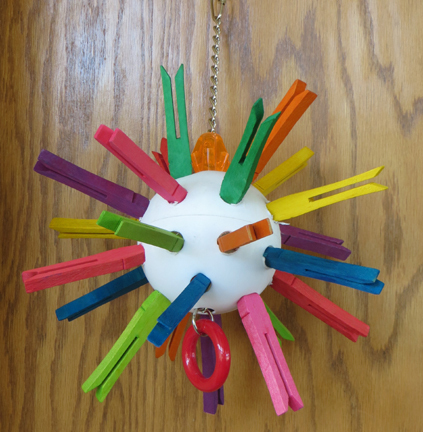 Stick Ball has a 4" Diameter plastic ball in the middle with lots of colorful clothes pins hanging out. These are GREAT places to put added shredding goodies like cardboard, corn husks (tamale wrappers), paper, etc. Encourage foraging behavior!! The colorful clothes pins are just one feature and easily replaced if your parrot doesn't destroy the ball itself. The Stick Toy is strung on nickel plated welded chain and topped with a pear shaped quick link for easy hanging and great for most mid to large sized beaks in your house!